Our W-Control blades for major electric and pneumatic oscillating tools enable an easy removal of window panes from nearly all vehicle types. The W shape potentially absorbs some of the vibration which makes using an oscillating machine more comfortable. 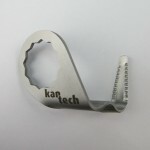 The blade is particularly durable due to our patented 3D-cold press forming for blades which condenses the material. 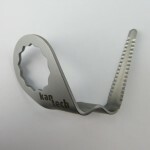 Moreover, the blades developed by KAN-Tech come with a high degree of tensile strength. The patented toothing allows an easy cut as well with high-modulus PUR adhesives.